And so the uncomfortableness continues: with thanks again to Discarding Images for the above, from their fine collection of medieval emoticons. As with the previous post, this continuation will contain images that are NSFW. 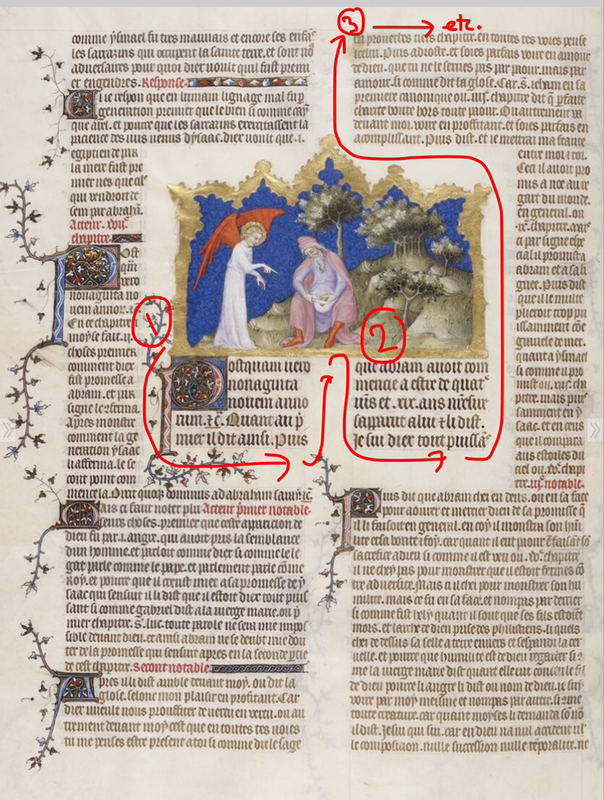 Our image of Genesis 17, attempting to capture and comment on the moment of v. 22, is from BNF 13597, a 14th-15th-century French Bible. That is, made in France and in French. 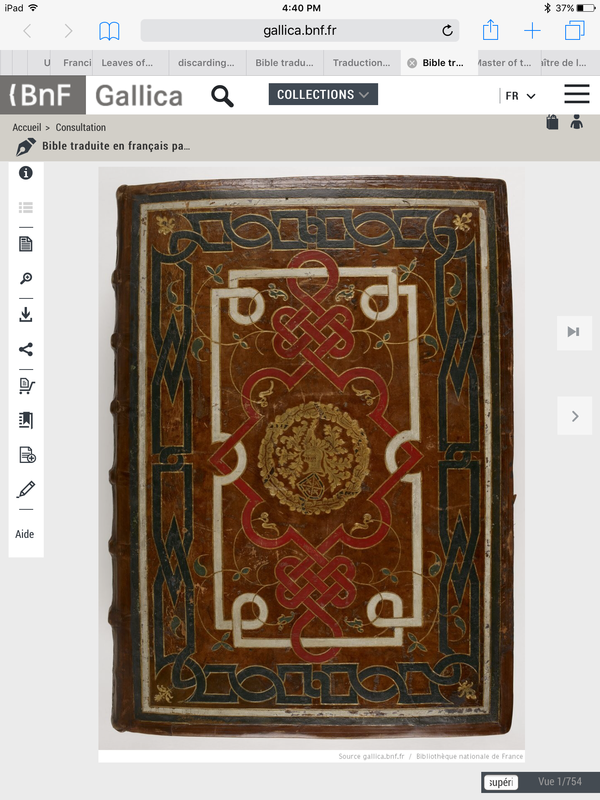 It is known as the Bible of Jean de Sy (that being the translator’s name) and commissioned in 1355-56 by the then French king, John the Good (II). 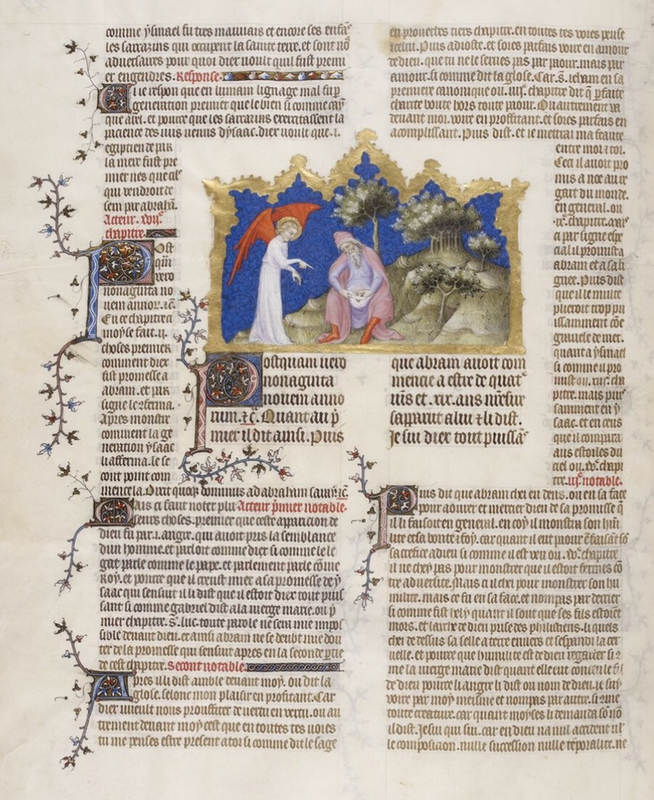 So, like the Roman de la Rose manuscript that started out the last post: this is a manuscript made for a king. The first illuminator is anonymous, known to be active in Paris around 1350-80; previously known as The Master of the Umbrella-Trees (not a joke), you can read more about him on French Wikipedia. 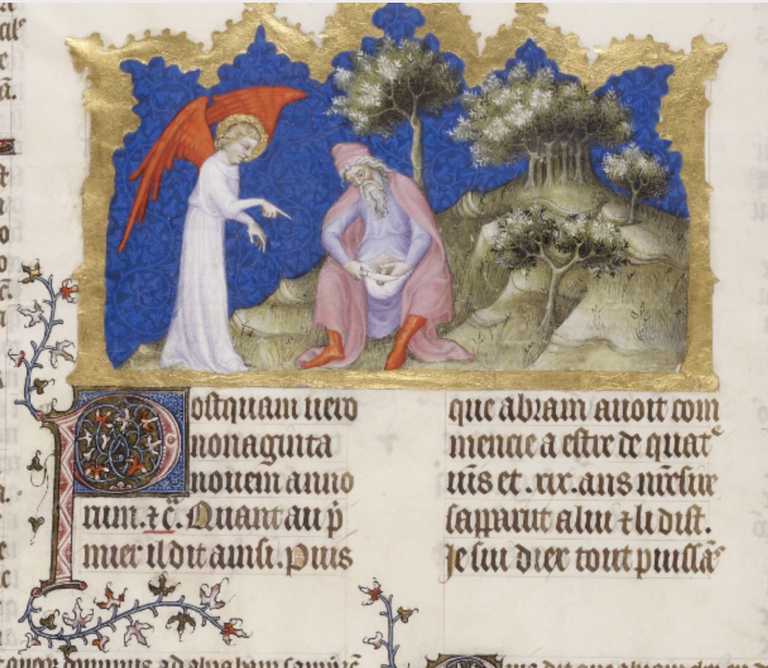 While he sketched all the illuminations, many were not painted and finished by him but by a second illuminator around 1380; this is the case of our f. 22v. For more on the manuscript, see its “Notice détaillée” by clicking on the “i” symbol on its page at BNF Gallica. Here’s the outside, for the bigger picture that is the full text, context, and paratext. And it is a big picture: the manuscript is 420 x 300 mm! That rubric serves the usual purpose of introducing the text that follows: literally and figuratively “framing” and “contextualising” it. Here in this case, introducing ch. 17 by way of its first sentence in Latin (the first clause thereof) and following that by the text in French. That initial use of Latin is interesting. It might seem redundant, as it’s followed by the exact(ish) same thing in French. That Latin clause is functioning as a memory-triggering place-holder chapter title / heading; bearing in mind that the Latin text is the best-known, and indeed the text, for that time and audience; though this is not the very first translation of the Bible into French. That rubric also acts as a caption that, like our 2016 captions in the previous post, points towards and culminates in a joke. The joke depends on reading the image and the rubric and the text together. 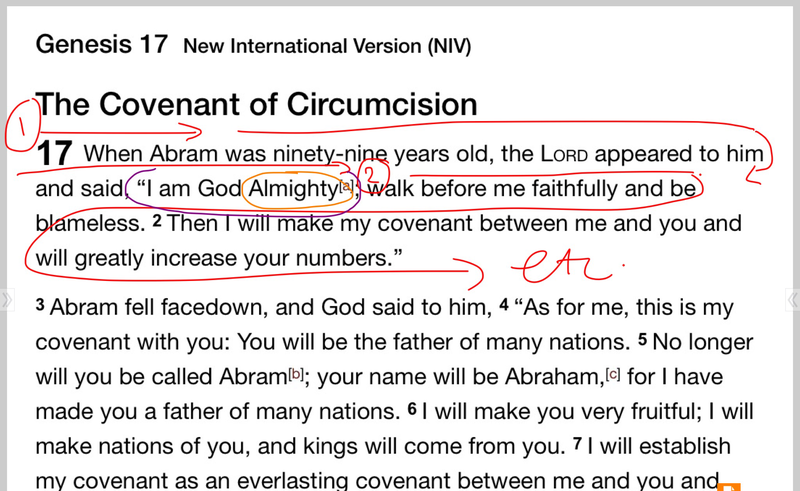 Rubricator, scribe, & illuminator—all the hands at work in the text (as it were)—point to one thing. One word. They’re pointing to one word. One word—not an image—is at the focal centre of this page as a whole. It is what brings all the parts together—image, rubrication, words, layout, and the invisible unrepresentable factors of reading (“translated” to us via the angel’s eyes and hands: perhaps the central mystery and miracle on the page)—as a unified text. So. In the ending-as-beginning of the joke, then, was The Word. And the word was PUISSANT. Doesn’t work in Modern English, alas, but f. 22 v. is an AWESOME and dangerously cutting-edge translation joke from Latin to French, to include references to royal authority, political power, sexual potency … and silent private reading and imagination. 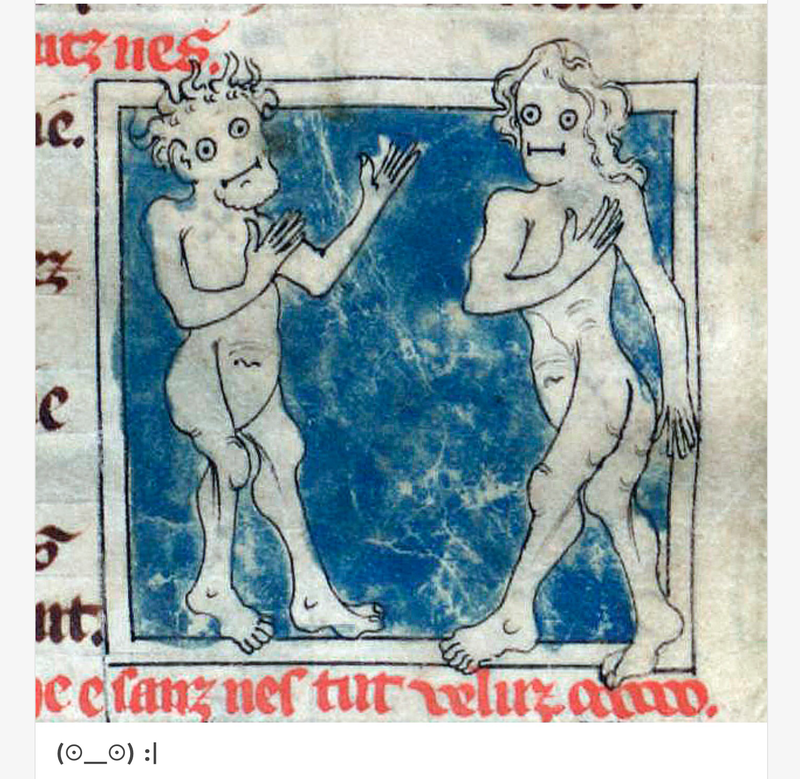 For more medieval d*** jokes, see completely NSF-North American etc.-W d*** pics here, and a more mixed naked bag and gender expression here, all from the good people of Discarding Images. Who are also good because they give full provenance credits: yes, manuscripts are out of copyright and in the public domain, but they are looked after caringly and at great expense by libraries. Libraries are under increasing threat in the present age of pseudo/neoliberal dehumanising idiocracy: YOU can help to support THEM every time you refer to one of their precious crumbling manuscripts! And you can support your fellow workers too, at the same time, through protecting COPYLEFT. And propagating its principles. 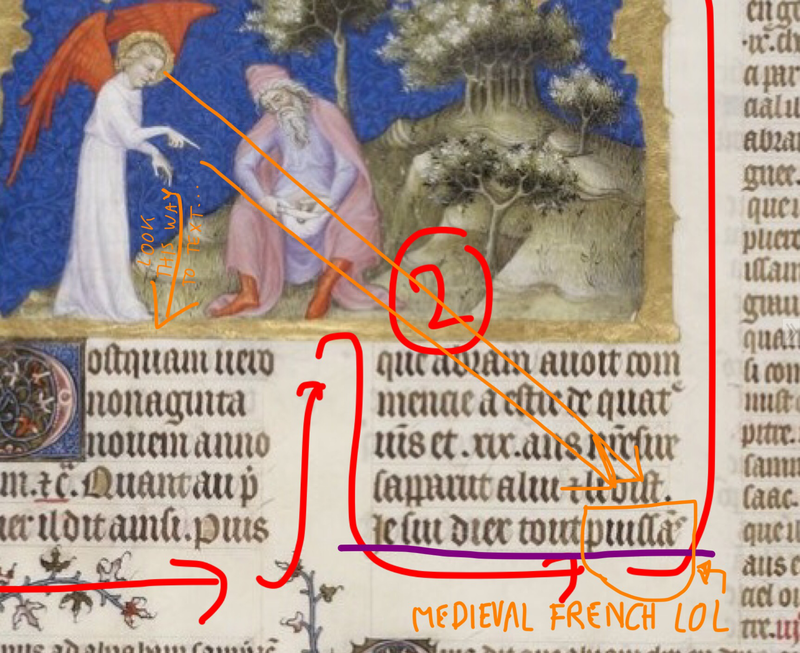 From preservation and cataloguing to digitisation and that other rubrication that is image-tagging: libarians are behind every medieval image you see online. We wouldn’t have this freely, democratically, openly accessible abundance of medieval **** pics (and the rest) without these fine, noble librarians and their libraries. It would take the tiniest easiest slip of a metaphorical knife to cut off that dissemination and to sever its source: restricting access to these materials to return us to how things were in the good old days, or indeed razing libraries and their contents to the ground. Returning to where we started, with Fortune’s Wheel. How bad (or medievally awesome) can things become if that were to be combined with CODEWORD: PUISSANT, being in a religious work, and residing in a royal library? Festal Missal, Garnerus de Morolio (scribe), Petrus de Raimbaucourt (illuminator); Amiens: c. 1323. Koninklijke Bibliotheek, Den Haag: Ms. KB 78 D 40, Fol. 33rb: margin. 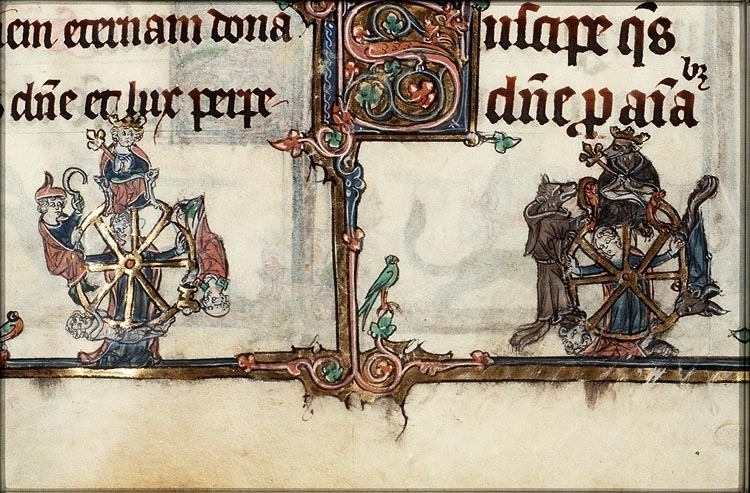 First encountered in 2008 via Got Medieval and their fine analysis, Mmm… Marginalia: Wheel of Reynard.